British mezzo-soprano Alice Coote is acclaimed around the world for her commanding performances in opera, concert and recital, in repertoire spanning from the Baroque to contemporary music. 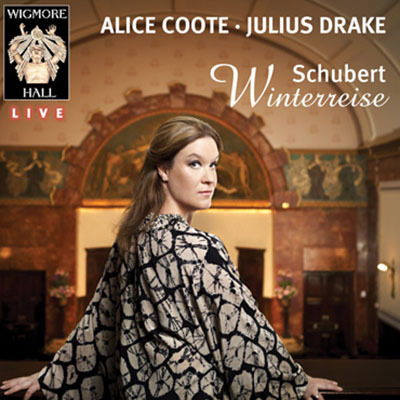 A regular favourite at Wigmore Hall, she returned with Julius Drake in February 2012 to record Schubert’s ‘Winterreise’. Traditionally performed by a male singer, this song cycle is celebrated internationally at the pinnacle of the German Lieder tradition. Offering fresh insight, and a unique perspective on the poetry, Coote unravelled this story with raw vulnerability as her heartfelt portrayal of emotional turmoil and destruction proved spectacularly engaging. With pianist Julius Drake expertly setting the tone from the outset, Coote took a kaleidoscope look at love, as she wholeheartedly plunged herself in the devastating story. At times emotionally overwhelming, her subtlety of expression unreservedly expressed a harrowing sense of rejection and loneliness. Truly taking the listener on a journey through the 24 poems, this landmark recording promises to be a must-have for any lover of song.